The development of an epistemology that explains how science and art embody and convey understanding. Philosophy valorizes truth, holding that there can never be epistemically good reasons to accept a known falsehood, or to accept modes of justification that are not truth conducive. How can this stance account for the epistemic standing of science, which unabashedly relies on models, idealizations, and thought experiments that are known not to be true? In True Enough, Catherine Elgin argues that we should not assume that the inaccuracy of models and idealizations constitutes an inadequacy. To the contrary, their divergence from truth or representational accuracy fosters their epistemic functioning. When effective, models and idealizations are, Elgin contends, felicitous falsehoods that exemplify features of the phenomena they bear on. Because works of art deploy the same sorts of felicitous falsehoods, she argues, they also advance understanding. Elgin develops a holistic epistemology that focuses on the understanding of broad ranges of phenomena rather than knowledge of individual facts. Epistemic acceptability, she maintains, is a matter not of truth-conduciveness, but of what would be reflectively endorsed by the members of an idealized epistemic community-a quasi-Kantian realm of epistemic ends. 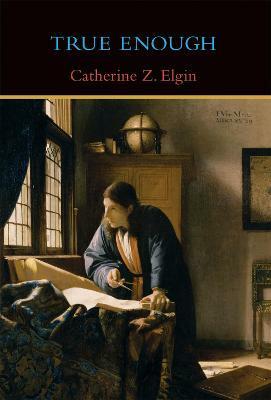 An impressively wide-ranging, meticulously argued, thought-provoking book...Elgin's True Enough is a philosophical tour-de-force of incredible breadth. -British Journal for the Philosophy of Science Elgin's project will show that we get on just fine, intellectually as well as practically, by replacing truth and knowledge with "true enough" and understanding. -Journal of Philosophy An original, fruitful blend of epistemology and philosophy of science...this is a wonderful book, written in an elegant and informal style, and replete with stimulating ideas on a wide range of subjects. Catherine Z. Elgin is Professor of the Philosophy of Education at Harvard Graduate School of Education. She is the author of Considered Judgment, Between the Absolute and the Arbitrary, With Reference to Reference, and (with Nelson Goodman) Reconceptions in Philosophy and Other Arts and Sciences.